We’re into the Festival finishing stretch with just a few days to go before the main required talent in town becomes grass restoration expert. But the tent and boardwalks remain for a few days yet and some businesses will even linger beyond the month of August. 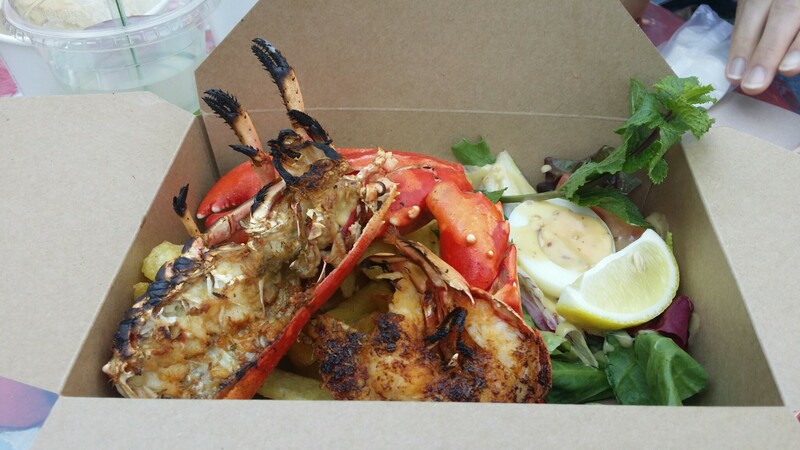 North Berwick’s famous Lobster Shack has been on a little Festival holiday to the city centre, setting up its informal al fresco seafood eatery out front of and in partnership with The Dome. They’ve been trading since the start of the summer here and are due to close on 30 August. We popped in between shows to give their wares a try. 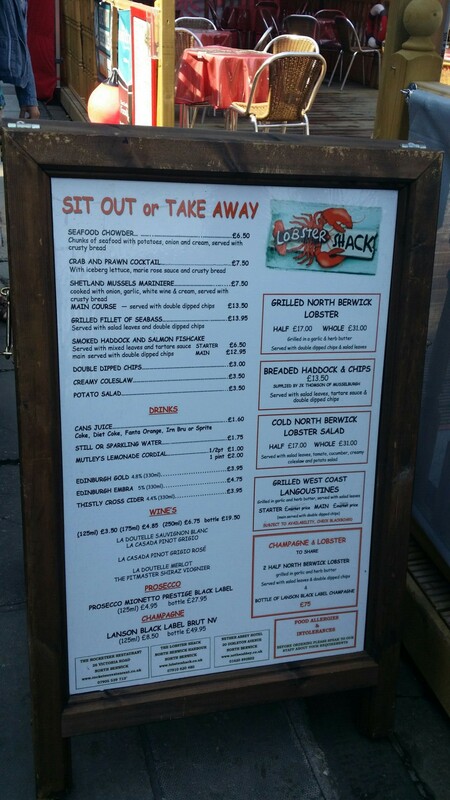 We have reviewed their North Berwick shack before, when guest contributor Kris found things a little underwhelming. Although it’s only a brief train ride away, I haven’t been to North Berwick for years. I should rectify that at some point soon. We were a party of four, today, with Julie, Tanya and Scott joining me. This meant we had a good look at the range of their menu. Firstly, the service was a little chaotic, with a strange approach to paying upfront and staff needlessly overcomplicating simple payment processes. They did get our dishes to us promptly though so all was good in the end. I was plenty hungry enough so ordered both their half grilled lobster (£17) for main and a portion of seafood chowder (£6.50). Scott followed this pattern. Julie opted for mussels (£13.50) and Tanya had the seabass (£13.95). 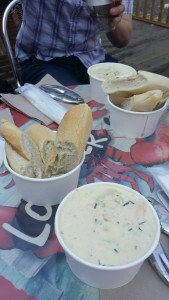 Chowders were first up and hit the spot very nicely. Richly creamy broth was packed with chunky seafood and profuse potatoes and corn. It was very pleasing stuff. The lobster’s tail meat was smoky from the grill, which may have been the desired effect but smokiness rather dominated proceedings. The claw meat was in a much more naturally sweet state and therefore worked much more effectively. The chips were pretty soggy and underwhelming. So overall, while there were some elements that weren’t quite up to scratch, there was enough very good quality to win the day for the Lobster Shack. It offered a great quick and fresh seafood option in the heart of the city. Catch it in its last few days during the Festival or at other times during its seasonal opening in North Berwick.